Silver Doctor – Trout Wet Fly Pattern Variation from How to Tie Flies, 1940, by E. C. Gregg. This Silver Doctor wet fly pattern is tied using the recipe from a book that was given to us by my father on the day he demonstrated his one and only fly tying lesson to my brother Larry, and me. I was 12 at the time. He had given us this tying lesson shortly after Larry and I caught bluegills on wet flies for the first time in a Pennsylvania farm pond near our “farm” cabin in Tioga County. We always called it the farm because it had been a family farm since the 1800’s. After that initial tying demo, which included dad tying three flies – a Royal Coachman wet and a dry, and one other pattern I can not recall, he unloaded the old roll top desk and gave us everything in it pertaining to fly tying: tools, materials, accessories, and containers. This included a copy of How to Tie Flies, 1940 by E. C. Gregg. It is a first edition too, part of the Barnes Dollar Sports Library. The back of Gregg’s book contains standard pattern dressings for 0ver 300 trout flies, and this version of the Silver Doctor, while including my substitutions of guinea fowl for the original teal and brown quill for the original mottled brown turkey or bustard, is the recipe from that book. 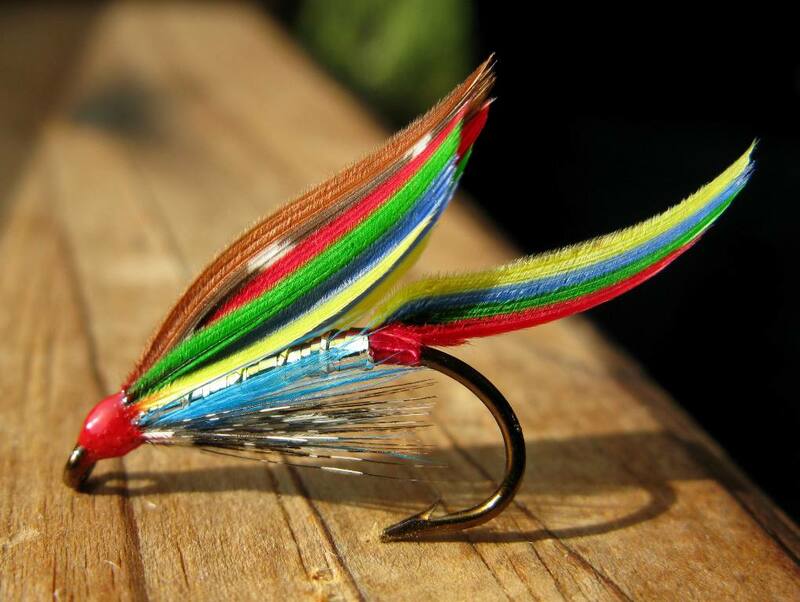 I was inspired to create the quill-winged version about eight years ago simply while looking at commercially tied Silver Doctor wet flies for sale in the Maine Guide Fly Shop in Greenville, Maine. These patterns had a simple duck quill wing consisting just of married blue and yellow. Seeing the duck quill married wing gave me the spark of an idea to create this version of the wing, using wing quill sections rather than the usual side feathers of teal, turkey, and goose shoulder. This wing, minus the strip of green, is the version I demonstrate in my DVD, Advanced Classic Wet Flies. I really like the four-color married strip in the tail on this version. The photo was taken with the fly pinned onto the windowsill in the classroom of Fishing Creek Angler Fly Shop and Bed & Breakfast, Benton, Pennsylvania, in 2009 during one of my weekend wet fly classes. Head: Red. I prefer to use Wapsi red lacquer to finish the head, even when tied with red thread. Clear lacquer applied as a final coat smooths out the red finish, because they are both lacquer-based products. Each time a new coat is applied, it softens the previous coat, blends into it, and then as it dries, continues a process of binding all coats of head cement together as one solid layer. The variation of this is when cements of different chemical composition are used. For example, I found out you can’t paint black and yellow eyes on the heads of streamers and use a clear lacquer based cement to coat them, because the final coat softens the eye paint and makes them run. Clear nail polish works well on this because the cements are different. The Silver Doctor wet fly was a very popular fly in the 19th century and still remains a favorite of wet fly tiers today. This entry was posted in Advanced Classic Wet Flies, Fly Pattern Recipes, Fly Tying Classes, Wet Fly Photos and tagged Advanced Classic Wet Flies, Don Bastian, E. C. Gregg, Fishing Creek Angler, How to Tie Flies, Maine Guide Fly Shop, Silver Doctor.